Today was my PAPA’s birthday. I have some very clear memories of birthday celebrations with him and various family members and each of them brings a smile to my face. How could they not? My PAPA was the best. 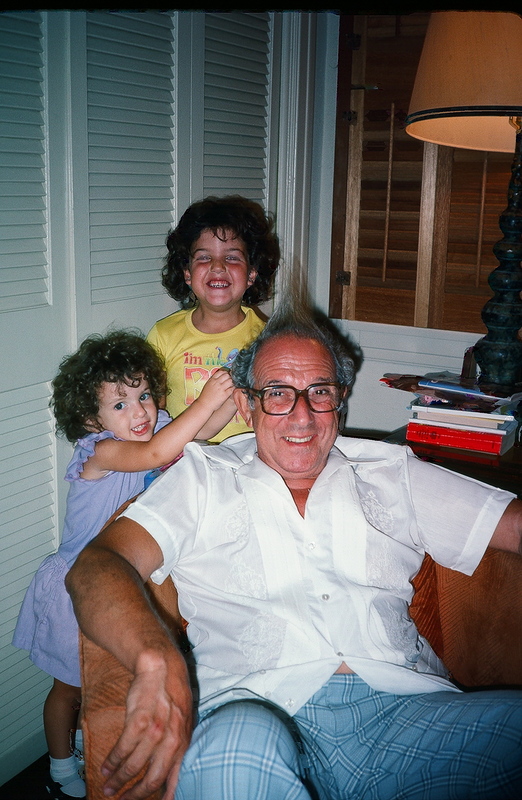 As you can see from the photo to the left, PAPA was very loving and tolerant of his grandchildren. He basically thought that we were the bees knee’s. He liked to eat delicious food (especially Chinese), travel, and spend time with the family all together. He and MY DAD shared books all the time. He sent the “Dow Theory Letter” to each of his four sons, and he was very philanthropic. PAPA had the opportunity, often with GRANDMA to see the world. As I recall from the map he had on the wall with all of the places he visited, no continent was untouched. He went to some really off the beaten track places: Tibet, the Galapagos, Antarctica, and so many more. He instilled a love of travel, or at least a tolerance for travel by taking us all on vacations together whenever he could. Thanks to PAPA and GRANDMA my cousins and I have seen some incredible parts of the world. PAPA lived a very good life. Though he was plagued towards the end of it with health challenges, he knew that he was the most loved father, father-in-law, brother, uncle, and the best PAPA his six grandchildren could ever dream of. We both agree it was and it always will be.